A three-bedroom-plus-study unit of 1,679 sq ft at the 99-year leasehold Quinterra on Holland Road is up for sale, with an asking price of $2 million ($1,191 psf). “The Singaporean owners are selling the unit with vacant possession, as they have upgraded to a larger property,” says Fanny Goh, associate group director at OrangeTee & Tie, who is handling the sale. Located on the second floor, the unit has an en suite master bedroom. The study in the master bedroom has been converted into a walk-in wardrobe, says Goh. The unit also has a north-facing main door and an east-facing balcony. Similar three-bedroom units of 1,600 to 1,700 sq ft at Quinterra fetched monthly rents of between $4,300 and $6,500 from 2016 to 2017. This works out to a potential rental yield of 2.6% to 3.9%, based on the asking price of $2 million. In June and October 2017, two 1,679 sq ft units on the second and third floors were sold at $1.9 million ($1,132 psf) each. Goh notes that the $2 million asking price for the unit on the market is negotiable. The 55-unit Quinterra in prime District 10 was completed in March 2009. It comprises an 18-storey block and is next to the quiet, landed residential enclave of Mount Sinai and near the landed homes at Holland Grove. About 650m away is Jelita Shopping Centre, with amenities such as Cold Storage supermarket, Guardian pharmacy and International Medical Clinic. Also nearby is the lifestyle enclave of Holland Village and Chip Bee Gardens, known for F&B offerings such as ramen restaurant Sanpoutei. Quinterra is located within 1km of Henry Park Primary School. Other institutions nearby include Nexus International School (Singapore), Eunoia Junior College, Singapore Polytechnic, the National University of Singapore, Yale-NUS College and INSEAD. 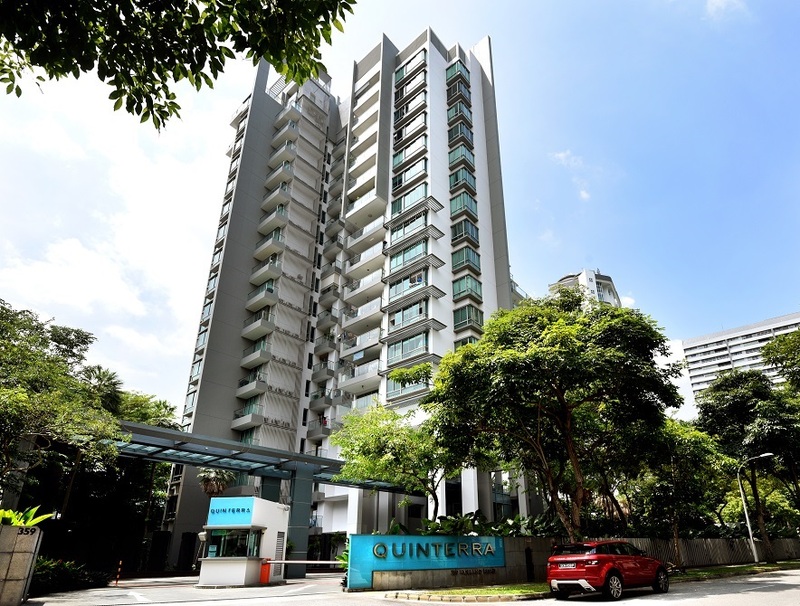 Developed by Singapore-listed property group Ho Bee Land, Quinterra was launched in July 2006 and fully sold within a year.